"...Have Orthodox Jews ever made the kinds of threats against this country and its people that we’re now hearing, things like withholding donations and terminating business dealings that will impair the Israeli economy? Have Orthodox Jews ever suggested, as Conservative clergyman Daniel Gordis has, that “Israeli hospitals survive in part thanks to American Jewish philanthropy. The flow of money should stop. Meetings with hospitals’ fundraisers should be canceled”? Have Orthodox Jews put constituent pressure on members of Congress to involve themselves in an internal matter of Israeli politics and religion and decry Israel’s lack of religious freedom for all America to hear, as heterodox Jewish leaders have now done?" Well, the unfortunate answer is yes, Orthodox Jews have indeed engaged in such actions. 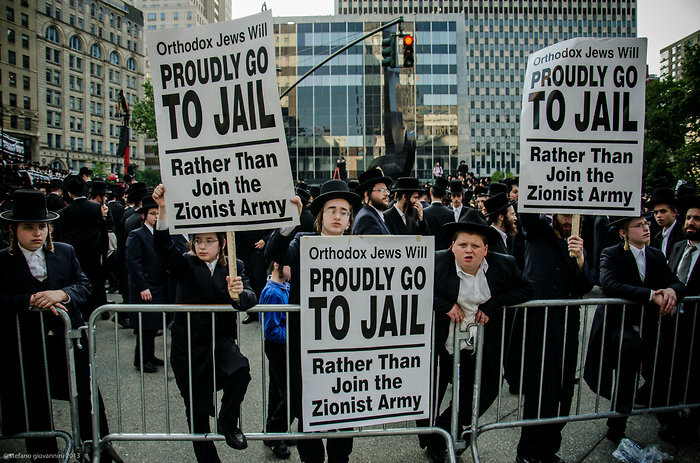 In 2013 there was a rally against the policies of the Israeli Government with regard to drafting yeshivah students, which was held in Manhattan, for all America to see. The rally had tens of thousands of people and numerous rabbinic dignitaries, including not only Satmar rabbanim but also Rav Elya Ber Wachtfogel, Rav Aaron Schechter, Rav Osher Kalmanovitz, Rav Shlomo Feivel Shustal, Rabbi Moshe Meiselman (who was once praised to the heavens by Eytan Kobre in a fawning profile in Mishpachah magazine) and others. The speakers described Israel as an "evil regime" and talked about how “the [Israeli] army was founded on murder and blood spilling.” The event was reported by the New York Daily News, along with various pro-Palestinian outlets who presented it as evidence that authentic Jews are opposed to the brutal Zionist regime. Then just a few weeks ago, there was a rally at the Barclays Center, primarily with Satmar chassidim but again also supported by Litvishe rabbonim such as Rav Elya Ber Wachtfogel, Rav Aaron Schechter and others. 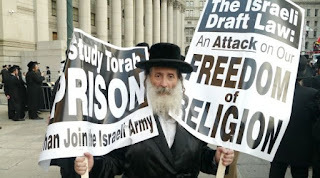 This event was likewise intended to send a message to people outside the Jewish community, as reported in a press release by The Central Rabbinical Congress of the USA and Canada (CRC): "We want the world to know about their (Haredi Jews) plight, that their religious rights are being systematically abused. The Israeli government isn't allowing for freedom of assembly or freedom of speech on this issue," said CRC spokesman Rabbi Isaac Green. Rabbi David Niederman, Intergovernmental Liaison for the CRC, stated: "International law under Section 18 of the United Nations Declaration of Human Rights demands for exemption of military service based on ones' sincerely held conscience. Unfortunately, it is a right that the Israeli government has withheld from our community." Nor did Rabbi Niederman describe the function of the effort as being limited to words - he said that he hoped to exert pressure in terms of financial aid to Israel. "Niederman said rally organizers hoped to influence American lawmakers who give Israel billions of dollars in defense aid. If the U.S. and Israeli governments don’t pay heed, the Satmar community will take additional steps, he said, though he declined to give specifics." 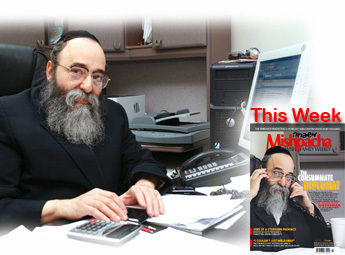 Rabbi Niederman should be familiar to readers of Mishpachah magazine, as he was once featured on the cover of the magazine, and he was praised as an outstanding example of an Orthodox Jewish diplomat. 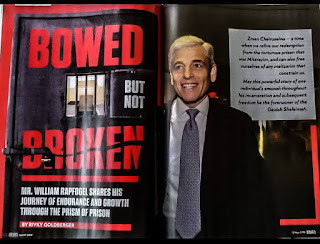 If Mr. Kobre is going to criticize non-Orthodox Jews for their betrayal of Israel, then he should not deny that the same sin is sometimes committed by Orthodox Jews, including those who are praised in this very magazine. You have a point, but Kobre's basic premise is nonetheless correct: Leaders of mainstream Orthodox organizations (e.g., Agudath Yisroel, O.U.) have never issued such threats. And those (non-mainstream) organizations that have issued threats never claimed to support the State to begin with. The people named in this article are just as significant as the non-Orthodox people that Kobre mentions. I have been puzzling about why they would have a demonstration regarding an Israeli internal matter in New York in the first place. Demonstrations are supposed to pressure those in power, so who exactly were the demonstrators trying to impress? None of those present vote in Israel. The answer I came up with is that the demonstration really wasn't directed at the military conscription issue at all. It was really directed at the rising new Democratic Party forces in the US, such as Linda Sarsour, Keith Ellison and others who are strongly anti-Israel. By bashing Israel in the demonstration, they are trying to get on the good side of these politicians by saying "see, we are anti-Israel as well", believing, wrongly, that it is Israel and Zionism which make non-Jews dislike Jews. How this idea is used to explain what happened prior to 1948 is beyond me. They don't realize they are playing with fire. The US State Dept for many years has lambasted Israel as lacking "freedom of religion" for excluding the Deform movement and keeping orthodox in control of religious matters. The State Dept seeks to de-Judaize Israel, and this type of demonstration only helps their cause. They are saying "Benevolent American goyim, please help us and put pressure on the Israeli govt menace" - OK we'll pressure them to accept Deform conversions and Fakestinian refugees, no problem guys. You rightfully called it Deform. Back in 2012 and 2013, I used to daven in Rav Shaul Arieli's shul (brother of Rav Asher Arieli from the Mir in Yerushalayim) in Kew Gardens Hills, Queens, NY. I remember him repeatedly calling to boycott Israel over the draft law. He even gave "practical" advice that if you have to fly to Israel for whatever reason, at the very least, don't fly El Al (Israel's official airline). He would also sound off about how Lapid and Bennet are rashaim and are bent on uprooting Torah from Am Yisrael. Rav Arieli is considered pretty mainstream, by the way, and his shul is largely comprised of working class, modern Orthodox and even includes many Israeli "traditional" types. I don't think Rabbi Schechter attended the 2013 event, and at the Barclays event he came late, spoke and then left. 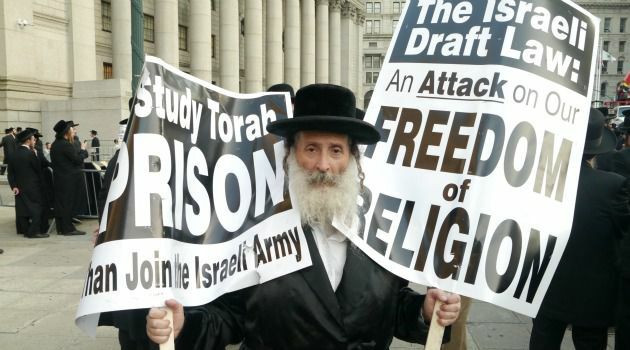 I think he wanted to protest conscription of bochurim, but I don't think he aligns himself with the Satmar ideology. Of course, I can't speak for him. Why not just advise people not to buy State Of Israel Bonds? I thought Rabbi Shechter did attend the 2013 rally. And if one is not in favor of Satmar idealogy, you don't show up and speak. I don't care if he came late and left early. You ignore it. He didn't. Rav Ahron Schechter unfortunately joined the cult of Rav Shmuel Auerbach. Other than that, he is not affiliated with Satmar and is not anti-Zionist per se. RAS stands up for the underdog. If he feels that the Sefardim are being discriminated vis-a-vis the draft, he will fight for them. More aptly the Torah and halacha prescribe intolerance, unfair discrimination and sexism. It is all OK because G-d told so.